Liven up your next party and get the mood going by giving all of your guests this 2 oz. mood shot glass! 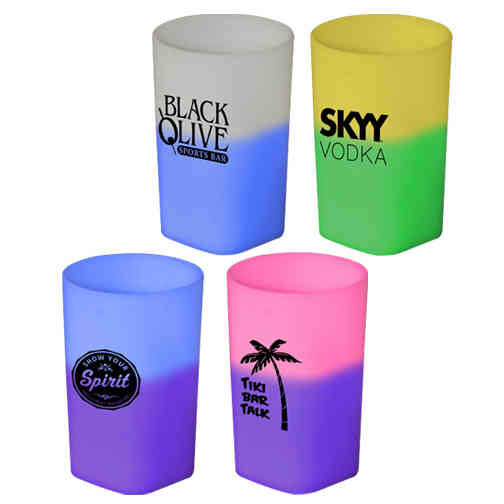 Made from a material that changes color when chilled, this 2 1/2" tall, BPA free shot glass is the perfect way to make sure everyone enjoys their night! The glass has a singular design with a square bottom and round top. A 1 oz. line marks the interior. Please note that severe weather conditions may affect the mood change. Imprint Size:15/16" W x 1-3/8" H per side. Ship Weight:16 lbs, Boxes are subject to "Dimensional Weight" charges.